Delegates to the First National People of Color Environmental Leadership Summit held on October 24-27, 1991, in Washington DC, drafted and adopted 17 Principles of Environmental Justice. These Principles were created to build a national and international movement to fight the destruction and taking of lands and communities and to secure political, economic, and cultural liberation denied for over 500 years of colonization and oppression. Since then, The Principles have served as a defining document for the grassroots movement for environmental justice. 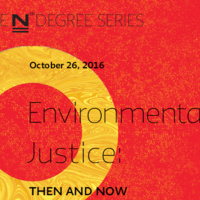 Join the Tishman Environment and Design Center on the 25th Anniversary of the adoption of these environmental justice Principles as we examine the issues of race and the environment in the 21st century. The event will feature a discussion with our faculty as they explore the themes of the Principles and opportunities for achieving environmental justice across different social movements, practices and disciplinary perspectives. Admission Free; registration required at the top right button.